The moon is waxing larger in the evening sky each night. The first quarter phase happened yesterday, and now it is a waxing gibbous moon. 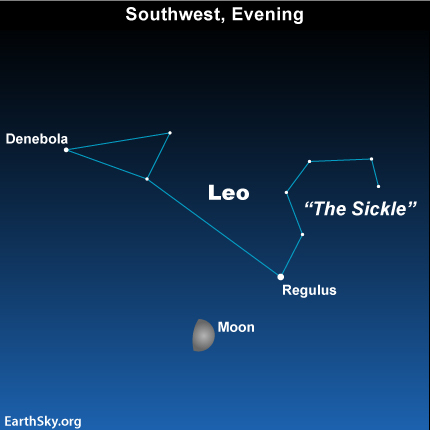 Tonight’s moon is near the star Regulus and brushing up against the belly of the constellation Leo the Lion throughout the evening. Regulus is the brightest star in the constellation Leo the Lion. It dots the backward question mark of stars dubbed the Sickle. The Sickle is what has called an “asterism” – not a whole constellation but simply a noticeable pattern of stars on the sky’s dome. The Sickle outlines the head and mane of Leo the Lion, and the triangle of stars to the left of the Sickle depicts the Lion’s hindquarters and tail. Regulus sits almost squarely on the ecliptic – the sun’s path through the constellations of the zodiac. Annually, the sun passes in front of Leo from about August 10 to September 15, and pairs with Regulus on or near August 23. On this date, Regulus rises with the sun, shines with the sun at midday, and sets with the sun. Six months later, in February, Regulus will be opposite the sun in our sky, lighting the nighttime from dusk until dawn. Tonight, watch for the moon to brush against the belly of the mighty Lion!